Greetings out there anglers! 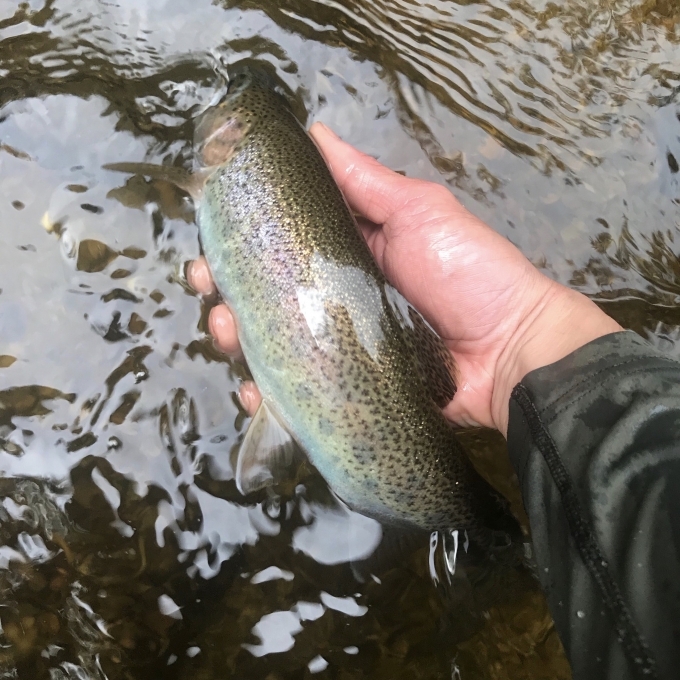 Trout fishing continues to be mostly weather dependent, with cooler mornings and after rain events getting the most action. Who knows, we may have left the majority of the heat and humidity behind us with this last bout storms that rolled through. At least for this coming week, the nighttime lows are looking good, so it is a possibility that some more water could be fishable in the mornings. Please do take temperatures before you start fishing. It seems that most folks are still pickling up fish on nymphs, mostly in sizes 14-16 and of the mayfly variety. I had some good success yesterday in off colored water with squirmy worms. I was also able to pick up a few fish on pheasant tails (Frenchie). The brook trout further up seem to be looking up for their meals as good reports are coming in of surface eats. Elk hair caddis and small foam hoppers are working well now. Some key areas to focus on for the next bit are two fold: if there is a push of water in the system that you are fishing, hit the edges of main current and right in the main runs with low and clear conditions. Keep your eyes open however, as with slightly cooler temps, the fish might begin to spread out a bit. If you are getting ready for a fun fall, now is a great time to check over your gear. Line cleaning is a good place to start as it doesn’t take too long to get lines back in good shape. A commercial fly line cleaning product is great, but a soak in warm water with a tiny bit of dish soap can get most of the grime off. I will even using some of the fly line towelettes to give a line a quick clean after a particular stint in a dirty stream. Leaders and tippet are other good places to look at. It’s ‘s quite maddening to pull some more tippet from the spool only to have it be only a 4 inch piece! An extra spool doesn’t take up much space if you think you are close to being out. Before long, we can put the thermometers away for the winter, but for now, let’s take it one week at a time. I’ll keep the fishing report updated as conditions warrant, until we get consistent cooler temps, but feel free to stop by the shop or email me, dave@mmvt.com. Good luck out there as we turn the corner into Fall.